SC notice to Centre on PIL seeking deletion of the word “SINDH” from the National Anthem. Advocate Sanjeev Bhatnagar can take solace from the fact that he has earned some gratitude from two diverse quarters. His (Indian!) Public Interest Litigation filed in the Supreme Court has warmed the cockles of the hearts of the rulers of our neighbour, who I am sure view it as “Pakistan Interest Litigation”, and they didn’t have to make any effort to try and prevail upon the Indian Government to delete reference to or mention of their territory in the Indian National Anthem; because some Indian was doing the job for them. The other organisation that is enormously grateful to Advocate Sanjeev Bhatnagar is SINDHISHAAN. Yes SINDHISHAAN. The movement for unification of the Sindhi Community was trudging along at such a snail’s pace that Sindhishaan was getting frustrated with the progress or rather lack of it, over the past 4 years. Then all it took was 48 hours - for the spark to ignite and the Sindhi Community raised its voice in unison all over the globe. The voice has become a Roar and all of us at SINDHISHAAN are thrilled at the outcome and are awaiting with bated breath as the events unfold – AT LAST THE AWAKENING! 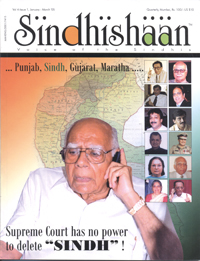 The day – 4th Jan ’05 began with disturbing news – it upset and hurt the sentiments of every Sindhi. Ever since childhood we have associated ‘Jana gana mana’ with our National Flag. Playing around with the National Anthem was tantamount to defiling the Tricolour. How could any Indian, let alone Sindhi, allow this transgression? In this issue we’ve tried to bring to our readers a snapshot representation of the Tsunami of indignation felt and resentment expressed by the community; the “hulchul” generated; and share with you the feeling of pure joy and ecstasy at being a Sindhi. Thank you Advocate Sanjeev Bhatnagar.